Two years ago my wife Abby and I replaced our aging DVD player with a new BluRay unit, and that unit came with a free month of Netflix. For those not in the know, the current iteration of Netflix is quite different than its original scheme. In the beginning, Netflix sent a subscriber up to three DVD movies at a time by mail, and when the subscriber sent it back, Netflix sent the next movie on the subscriber’s list in its place. Now, however, Netflix is primarily a programming streaming service. The change created an uproar among customers, but despite the uproar about how Netflix changed, I honestly think it is truer to the name Netflix than ever. My sister and I talked on the phone last night about it, and her hairdresser wanted a list of recommended television series we like that are available on Netflix. Flashpoint. Also known in our house as Flashbang, Flashmire, Flashwife, and Flashpoink. This is about a psych-profiling SWAT team in a modern Canadian city (Toronto, though they never say so.) Best feature: edgy filming, engaging action, Amy Jo Johnson‘s tactical pony tail. Worst feature: sometimes too touchy-feely. Numb3rs. Also known in our house as Mumblers or Math N3rds. This is about an FBI agent whose brother is a math genius who uses math to help the FBI catch criminals and save lives. Best feature: makes math actually interesting and engaging; action sequences produced by Tony and Ridley Scott. Worst feature: overly-complicated plots can be a bit contrived so they can involve math. Longmire. Also known in our house as Waltmire, Quagmire, or Bagmire. This is about a small-town sheriff of a wild Wyoming county. Best feature: while it is set in Wyoming, it is filmed in New Mexico, and Abby and I want to go literally everywhere we see in the show; Robert Taylor’s laconic portrayal of the title character. Worst feature: somewhat self-indulgent plot wrinkles about the personal lives of the main characters. Watch any movie about police or military use of firearms. You will probably experience a moment of tension, raised, oddly enough, with a strange but telling piece of action: operating a semi-automatic weapon. It sounds like “chick-chick,” and is supposedly the sound of the person holding the gun operating it by either pulling back and releasing the slide on a pistol, pulling back and releasing the charging handle on a rifle, or pulling and pushing on the slide on a shotgun. Bad guy comes up from behind the good guy and chick-chick‘s his gun to let us know he’s ready to shoot. A criminal raises his gun and all the cops chick-chick their rifles to let us know they are ready to gun him down. Our heroes cautiously enter a darkened warehouse and chick-chick their shotguns so they are ready to confront the monster. The problem is this: almost everyone who carries a firearm – cops, SWAT teams, soldiers, me – keeps a round in the chamber – they already chick-chicked their weapon when they loaded it. If you operate a loaded semi-automatic firearm, the first thing that happens is that it ejects a live round. The reason is that we have a gun in case we need to shoot something, and it makes sense to keep a round in the chamber… like keeping gas in the car. When Abby and I carry, we always have a round in the chamber. Also, let me say once again that soft cover is no cover at all, and in a tactical situation, if you don’t get to cover, you might as well just paint a target on yourself. 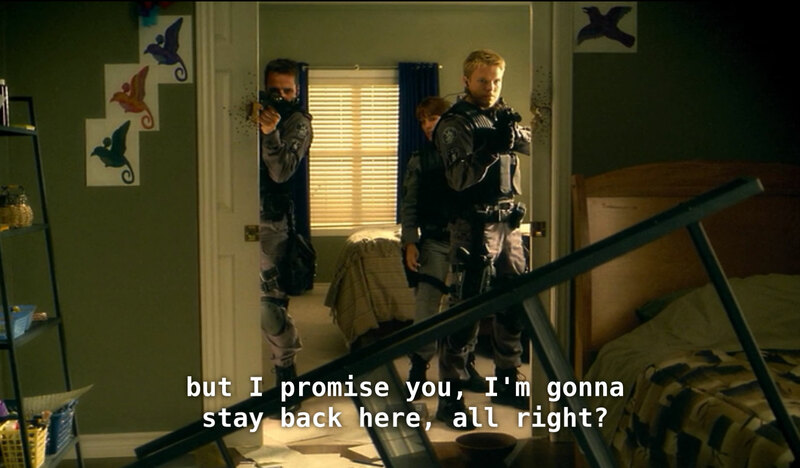 Drywall and good intentions are NOT cover, as made obvious in this absurd scene from Flashpoint. Finally, there is a huge amount of talk on social media about the recent tragedy in Paris in which many people were gunned down in coordinated terrorist attacks. There’s a lot of the gun nut’s old saw about, “If the citizens were armed, they could have fought back.” I’m sure it’s comforting to imagine being able to defend yourself in the face of such violence, but for the Paris attacks, I am leaning toward one of the most important rules of a gunfight: “Nearly every gunfight will have more people you don’t want to shoot than people you do want to shoot.” I’m sure the gun nuts fantasize that they will never miss and only need one shot to do away with their foe, but the truth is that in the chaos of a coordinated attack, your good guy bullets flying around will probably just make the situation worse. Your recourse in such a situation is to flee if you can and get to cover if you can’t. Finally, the “Good Guy with a Gun” paradigm comes into play, which says that the only thing that can stop a bad guy with a gun is a good guy with a gun. To some degree, this is true, but in the end, the trained and coordinated good guys with guns are the ones who can really stop bad guys. Abby and I don’t carry sidearms to mete out justice or earn hero points. We carry so we have a final recourse when all other options are exhausted. For what it’s worth, Netflix still has the mail option; we get up to two BluRay discs at a time. Our WiFi signal just isn’t strong enough to stream at decent quality. >>WiFi signal just isn’t strong enough<< I put in a big double-antenna WiFi router and it out-streams the modem by threefold. We seldom buffer.